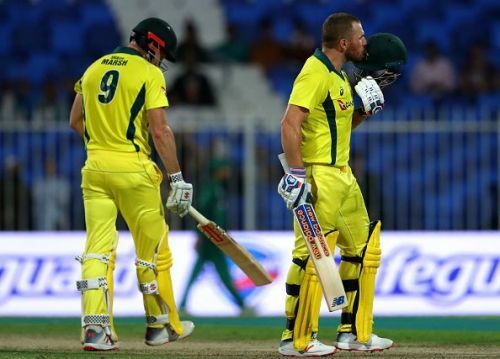 Australia continued their good form with a crushing 8-wicket win against Pakistan in the first ODI played at Sharjah Cricket Stadium on Friday. Despite Pakistan posting a competitive total, Australia chased down the target with ease. Pakistan captain Shoaib Malik won the toss and decided to bat first. Imam-ul-Haq and Shan Masood got the team off to a steady start, adding 35 runs for the opening wicket. Nathan Lyon got the breakthrough though, dismissing Imam-ul-Haq for 17 runs. At end of 10 overs, Pakistan were 40 for 1. Shan Masood and Haris Sohail steadied the ship with some lovely strokes. The duo added 43 runs for the 2nd wicket after which Coulter-Nile dismissed Masood for 40. Sohail and Umar Akmal then put up another brilliant partnership of 98 runs for the 3rd wicket. Sohail reached his fifty off 68 balls and looked in complete control, continuing to play with an attacking mindset. Sohail reached his maiden ODI century off 114 balls and remained not out on 101m helping Pakistan post a competitive total of 280 for 5 in 50 overs. Chasing a target of 281 runs to win, Australian captain Aaron Finch and Usman Khawaja gave the team a brisk start, putting on 63 runs in 11.1 overs. Faheem Ashraf struck to dismiss Khawaja for 24 but Finch continued to attack, reaching his fifty off 63 balls. Shaun Marsh took time to settle but he too got going, reaching his fifty off 68 balls. Finch played a captain's knock to amass yet another century after which he was dismissed for a brilliant 116. Marsh and Peter Handscomb added 46 unbeaten runs for the 3rd wicket which helped Australia seal an 8-wicket win with 1 over to spare. The 2nd match will be played at the same ground on 24th March.